What they do all day? Where there's a clinical trial, clinical research associates are making sure it's going the way it should. That means monitoring procedures and results and making sure that researchers are following proper protocols at every step. How to get the job? A bachelor's in science, sociology or psychology is a good foundation, as is experience in a clinical trial environment or in health sciences. Some employers look for a CRA certification, such as the one offered by the Association of Clinical Research Professionals (ACRP). What makes it great? Since there are so many different types of clinical trials, the work environment can be dynamic with tasks varying from day to day. CRAs can specialize in a particular subject area, or go for a broad base of knowledge and hop from topic to topic. And growth potential is strong: As personalized medicine becomes more common, clinical trials will increasingly be needed to make sure drugs and devices work properly. What's the catch? Most CRA jobs require at least some travel regionally, if not nationally or internationally, which can mean long hours and lots of time away from family. --K.A. 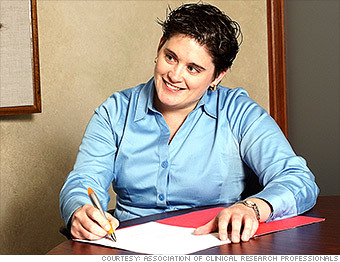 Do Clinical Research Associate s have great jobs, or what?